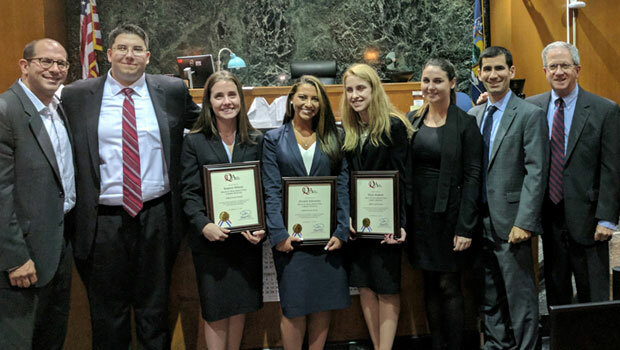 The team of Hofstra Law students (second through fifth from left in photo) Dylan Nesturrick 3L, Kimberly Wilkens 2L, Elizabeth Johannesen 3L and Allison Stapleton 3L won the Queens District Attorney’s Office fourth annual Mock Trial Competition. The competition allowed the law students on the 14 teams in the competition the opportunity to try a murder case, under New York law, before sitting Supreme Court justices and Criminal Court judges. The coaches for the Hofstra Law team were (at left in photo) Jared Rosenblatt ’03, faculty advisor to the Hofstra Trial Advocacy Association (HTAA), and (sixth through eighth from left in photo) Jana McNulty ’14, Phil Nash ’13 and Professor Fred Klein, a former chief of the Major Offense Unit in the Nassau County District Attorney’s Office. The competition was held on Oct. 14-15 in the Queens County Courthouse, in Kew Gardens, New York. Hon. Joseph A. Zayas, administrative judge of the Supreme Court, Criminal Term, Queens County, presided over the final round. 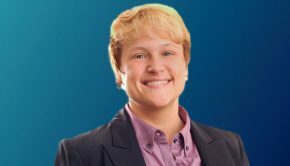 Each year, the Queens District Attorney’s Office hires several participants from the competition as assistant district attorneys, while others have gone on to careers in other prosecutors’ offices in the New York City area and elsewhere.